Brief: Create a website to promote the US brand "Stony Yogurt" to a UK audience. 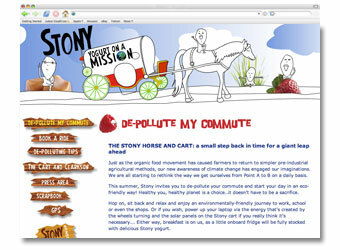 The Stony characters and some simple animation should be used to publicise a promotional horse and cart ride to work. Solution: Mavo looked at the overall brand image of Stony Yogurt. The use of white space and flashes of colour ensured that the website was easy to read and navigate for users of all ages.